Rob and Michele Pickering of Middlefield Stud have a young and exciting band of stallions, with the focus of this week’s stallion profile, the Australian import, Rocky Street. Rob explained what a lovely temperament Rocky Street has and we got to experience it first hand. After being assured that it was completely safe, having entered the paddock with Rocky Street, he began to gallop around and gave an impressive account of himself. 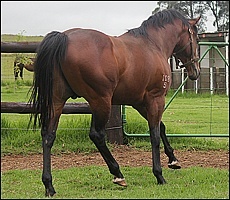 He is an eye-catching bay, with good ample muscle tone, beautifully put together and conformed with a handsome head, he bears a strong resemblance to his famous father Rock Of Gibraltar, nick-named ‘The Rock’. Michele was standing at the top of his paddock towards the gate and after he had been setting his paddock alight for about 10 minutes, he ran straight up to Michele. He stood there, breathing heavily with adrenaline coursing through his veins, when Rob pointed out that Michele’s phone had fallen and was in fact lying against Rocky’s front hoof! She approached this large stallion and bent down to pick her phone up. He stood quietly, his legs quivering from the gallop, not moving an inch whilst she retrieved her phone, fortunately still in one piece. Many a stallion would have taken the opportunity to have a nip, yet he didn’t. He was a total gentleman. Rock Of Gibraltar currently stands at Coolmore Stud in Ireland alongside the likes of the great Galileo. His stud fee for 2012 is 17,500 Euros. 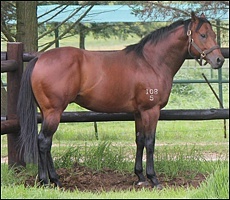 He is a son of Danehill out of Off Shore Boom, a Be My Guest mare. Rock Of Gibraltar set the track alight with 10 wins – he became the first horse ever to win seven consecutive Grade 1s in the Northern Hemisphere, breaking the great Mill Reef’s 30-year-old record. 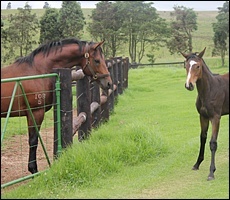 He was co-owned by Sir Alex Ferguson of Manchester United fame. His wins include the Gr1 2000 Guineas, Gr1 Irish 2000 Guineas, Gr1 St James Palace Stakes, Gr1 Sussex Stakes, Gr1 Prix du Moulin, Gr1 Dewhurst Stakes; and a second in the Gr1 Breeder’s Cup Mile. He was given a Time Form Rating of 133 and has gone onto sire a number of Grade 1 winners and become a Sire-Of-Sires himself. From Rock Of Gibraltar’s first four crops on the track he is already the sire of 39 Northern Hemisphere SWs including Grade 1 winners Society Rock, Mount Nelson, Diamondrella, Varenar and Eagle Mountain, Grade 2 winners Kitty Matcham and Gibraltar Blue and Grade 3 winners Samitar, Yellowstone, Genuine Devotion, Sweeter Still, Rock of Rochelle, Theann, Utrecht, Unilateral and High Rock. 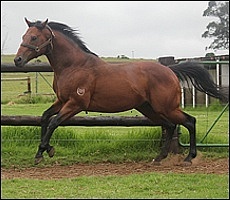 His dam Lezayre – by Keltrice – is a 10-time winner, of which 5 wins were at the age of 2 in Australia. She placed second in the Grade 3 Irwin Stakes and Malaysian Airlines Stakes (Listed) and ran a third Cinderella Stakes (Listed)and a fourth in the Grade 3 SAJC Dermody Stakes. 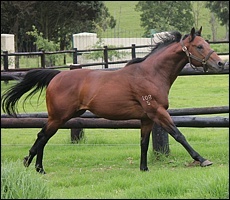 To date she is the dam of 4 foals and 3 winners including a full brother to Rocky Street – who is a 2 time winner. Rocky Street(AUS) has his first crop of foals on the ground this year, to view them please click here. The syndicate that own Rocky Street have come with a clever breeding arrangement where a limited number of mare owners are given a chance to effectively “own” a share in the stallion, to prove him for themselves at no cost apart from the first service fee thereafter a free service every season to any mare, subject to a few non onerous conditions, a special life time free service. Contact Rob at Middlefield Stud to find more about the deal.